Last week we began first of our series of weekly reader contests: We asked you to tell us about your favorite butcher shop, choosing one winner (he’s announced below) from comments on both Edible Brooklyn.com and Edible Manhattan.com to score one lovely little Fyrkat grill. 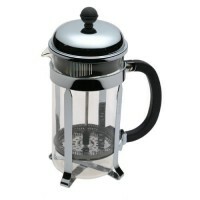 This week’s contest winner will take home one of those pricey Bodum presses. Now back to last week’s contest winner: Your answers were amazing, calling out butcher shops and shopkeepers from both Brooklyn and Manhattan that both know their trade and choose their proteins wisely. (We encourage you to read about them both on Edible Brooklyn’s site and right here.) It was tough to pick a winner, but we chose Peter Durnin, a commenter on Edible Brooklyn’s site, because, well, he told us about a butcher shop that wasn’t even open yet. Impressive. Durnin suggested Tiberio Custom Meats, a little shop currently run in the window of Sauce restaurant in the Lower East Side by former Dickson’s Farmstead Meats man Adam Tiberio. (Dickson’s is in Chelsea Market, and it was a top choice among commenters, who pointed us to plenty of spots around the city.) Tiberio, who is hoping to open a USDA-inspected cut-and-wrap meat processing facility in New York City to serve not just us but restaurants, Greenmarket farmers, and other meat companies–even ran a workshop this year at New Amsterdam Market on meat cutting and getting more sustainably raised meats onto city plates. Thanks to you, Peter, we will be sure to!